wants to fly and ride a horse and ride a flying horse. 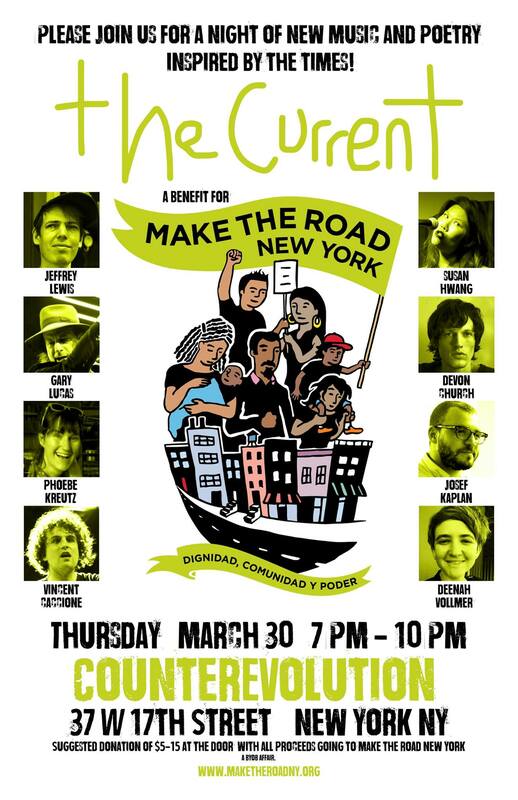 Tonight I’m playing a show called The Current curated by writer and musician, Deenah Vollmer that raises money for immigrant advocate group Make The Road. Musicians and poets are performing new work in response to the times at CounterEvolution – the beautiful venue created by Jim Malone (who knows what to do with reclaimed bowling alley wood). Doors are at 7pm tonight. 37 West 17th St., 2nd floor, Door code 2695. It’s BYO so I’m headed to the Trader Joe’s for some snacks in a minute, and we can all share. Lusterlit (my duo with Charlie Nieland) are on the bill with poets Deenah, Niina Polari and Josef Kaplan and also musicians, Gary Lucas, Phoebe Kreutz, Vincent Caccione, Devon Church and Jeff Lewis. But you know how when you’re working on something, suddenly it’s everywhere. I spoke a lot about music and my family’s experience as immigrants in an interview last week. I didn’t intend to. 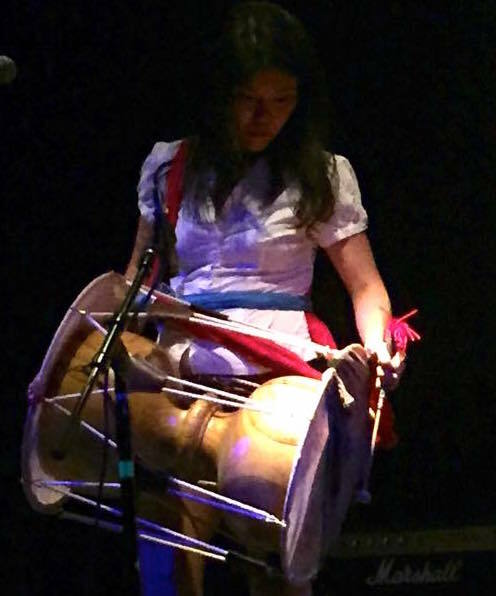 Writer and radio host and producer, Jia Jung approached me about participating in her podcast with John Asante, Play It Back, which focuses on songs and the stories around them. I didn’t know when she asked me that I’d delve into my earliest recollections of songs sung, how music reflected my family dynamics and how a single song can steep layers of personal history with understanding and meaning that keep being revealed to me. GEORGIA ON MY MIND – My father loved this song. My father loved singing. Mostly he sang old Korean folk songs or Korean pop songs from the 60s and 70s. But he’s from a family of singers. I mean we’re Korean, so it means you sing. You sing whether you can or like to. But most of us can and like to. My father’s parents were famous for having great voices and really killing it in duets at parties. I found out years later that my grandmother was also a riot and was known for her jokes and storytelling. She was illiterate and could barely sign her own name, but she was the life of the party and the apple of my grandfather’s eye. My father was… not so much the life of the party. Not that he didn’t love them. He loved hanging with his buddies more than anything, but he’d be the quiet one, laughing at all the jokes. He was a non-talker, like a lot of dads of that generation. But his English never improved to the degree of my mother’s so that put another barrier in communication between us. I speak great three-year-old Korean, and when I lived in Seoul briefly in the 90’s my Korean improved to where I could comfortably keep up with my uncles in conversation and soju (it’s nice how they help each other). But I never gained fluency enough to speak as freely as I would have liked with my father. And he never drank soju. Life in America wasn’t easy. Raising three kids who got so much better at maneuvering in this new culture than he ever would wasn’t easy. He was riddled with frustration and regret that he would never speak but that I could always feel. But even with or even among all the struggle, there was music. There were songs. They were windows of ease. They were meditations; they were unadulterated spaces of feeling good and not much else. I mean, that’s how I feel about Ray Charles. That is a universally agreed upon fact about Ray Charles, right? And I like that Ray Charles could be that for my father, and can be that for me. I’m extremely grateful for Ray Charles providing my father with some peace, because god knows, I wasn’t going to do it (he worried about me until the day he died. On his deathbed he was trying to convince me to not hang out with musicians because they can’t function in society… sigh. Sorry Dad.). My father had never been to Georgia, would die without ever setting eyes on Georgia, maybe didn’t even know where Georgia was on a map, but that song was Georgia to him. That song was a moment of peace, a feeling of beauty, bounty and freedom for him. He gravitated toward those things. I do too. It brought him to this country. It brings me to making music with everything that I have. During his last days, I was back and forth a lot from New York to Maryland to stay with him in the hospital and support my mother. Liver failure is terrible, and they make you do it in a paper bib which I don’t know how that helps matters any. My father was often really agitated and in various states of lucidity. My mother did everything she could to bring any amount of relief to the situation which was mostly hand-making my father’s favorite dish daily–a cold noodle soup called nengmyun (a North Korean specialty – my father’s family was originally from North Korea). My sister and I did what we could. We sat and sang “Georgia on My Mind” to him. It was pre-ipod times, and we didn’t think to bring CDs. We did what we could. We’re no Ray Charles, but we were there, and we sang a song he loved for him. And these days, I love the song even more because when I hear it, not only do I hear Ray Charles, but I hear my father singing along in his Korean accent. It’s a way for me to remember him, to love him and to keep hearing the sound of his voice.